You are here: Home / main dishes / Mexican Pork Chops & a Slow Cooker Giveaway! Mexican Pork Chops & a Slow Cooker Giveaway! These simple but flavorful pork chops cook until tender in the slow cooker, ending up with a luscious sauce. Served over rice and a side salad, it’s the perfect comfort food for this Caribbean girl! Lately, we’ve been keeping our meals extra simple and these Mexican Pork Chops fit the bill perfectly. 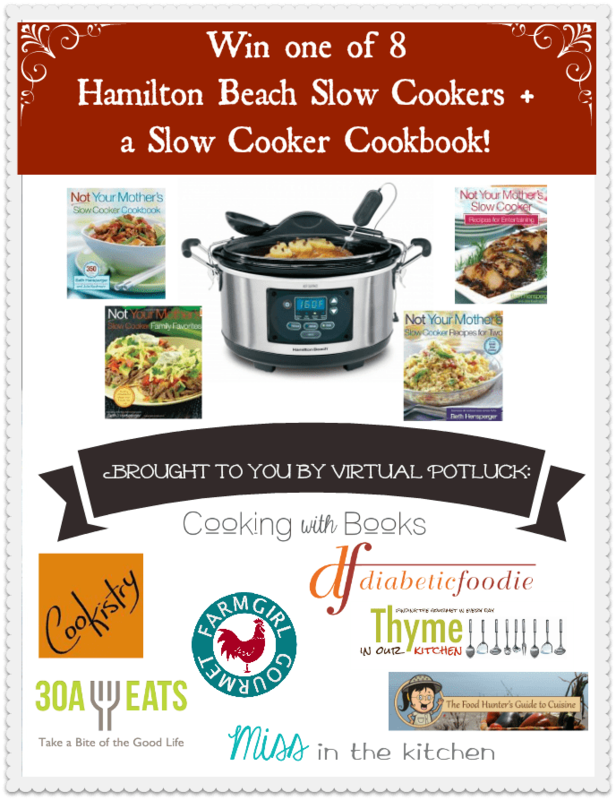 But first, a confession: I’ve never cooked in a slow cooker before but with the help of this cookbook and the ease of using this Hamilton Beach Slow Cooker, it couldn’t have been simpler. It was one of those days last week when I had a million errands to run: check the USPS, check the mail room (for Fedex and USP packages), deposit a check in the bank, pick up a winter coat I had dry cleaned, and stop by the grocery store for a few ingredients for a recipe. I knew I wouldn’t want to cook after running around town, so before heading out, I threw this pork chops and some Sabra Peach Mango Salsa in the slow cooker and crossed my fingers. I knew I’d have enough time to boil some rice to serve with this meal and make a quick salad to go on the side, but to know the main protein was taken care of, was a sigh of relief. A few hours later as I step back inside our home, the smell is amazing. Sweet tomatoes with a kick of spice from the salsa and I know those pork chops are going to be crazy tender. I quickly threw all the mail and errands in the hallway and sat down to enjoy a warm meal with my husband. Simple, flavorful, and uncomplicated – just how I like my life to be. About the Hamilton Beach Set & Forget 5 Quart Slow Cooker: three-heat settings allow for a variety of cooking options; five-quart capacity allows you to cook for a small group or just the two of you; the probe setting enables you to hit a desired meat temperature; removable, dishwasher safe stoneware and lid! On the stove top, sear the pork chops in the olive oil quickly. Place pork chops, salsa, citrus juices, and seasonings in the slow cooker. Cover and cook on HIGH for 3 hours, until meat is tender. Serve over rice for a twist on authentic Mexican food! Disclaimer: This is a sponsored giveaway. The Slow Cooker Meatballs and Gravy on Pinterest was to die for!! We had it last night and after working outside in the Autumn leaves all day it was a treat to enter the house and have that wonderful aroma greet us. November 1st means it’s the day for our traditional Norwegian Fish Chowder….I’m going to fill the slow cooker with hake, cod, shrimp, and salmon in a creamy vegetable base. I hope It lasts all weekend. I’d love to make chili! I love making chili during the season, that would be number 1 in my pot!! I love my slow cookery my Fave recipe is creamy chicken, sour cream, creamy soup and chicken breast. Yum! Wanted to try HB’s Slow Cooker White Chicken and Corn Chili in the beautiful green bowls that I pinned but the recipe is not available. Thought maybe you could help me find it…it really looks good. The slow cooker hot apple cider from Taste of Home and the falling leaves were a wonderful combination this weekend. Will do again next weekend. In the crock today….a creamy tomato basil soup. I’m going to try this. It looks yummy. I have a variety of slow cookers to fit small and large meals. I use my slow cooker at least 3 times a week. I love it! This looks so amazing! I love making pork chops in the slow cooker. Italian beef sandwiches. My favorite in the crockpot. I would make spicy chili with beans. I’m REALLY craving pork chops now. I think I can actually smell this! I would make Moroccan spiced lamb with green olives and red onions! I have the exact same slow cooker and I love it! I didn’t realize the stoneware was dishwasher safe. I’ve been using the reynolds slow cooker liners to help with clean up. Those things are hit or miss… Thanks for supporting this giveaway! Snow is gone so to celebrate I’m going to fill my slow cooker with Martha’s ingredients for Bacon Jam, one of my favorite Pinterest recipes. I would make roast lemon chicken. YUM that pork chop looks delicious!! I would make chili or soup and pulled pork BBQ! 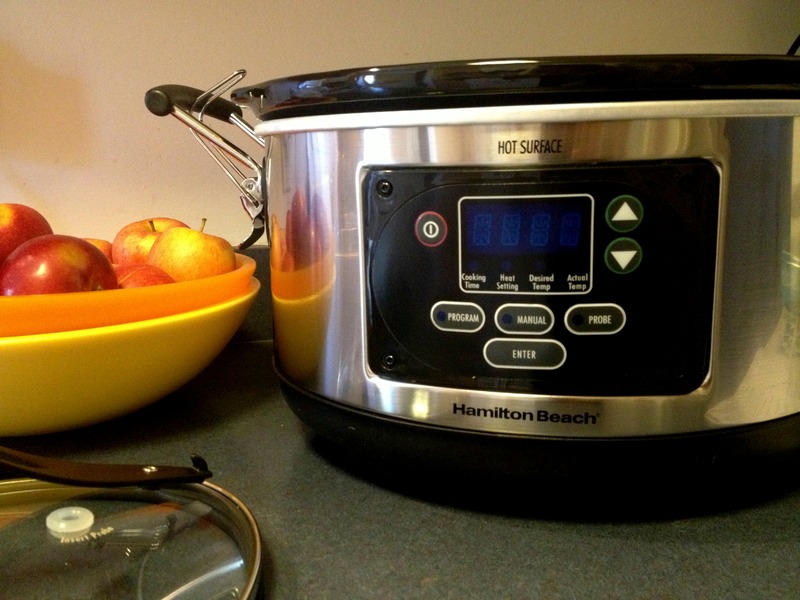 I’ve never used a slow cooker….I’m thinking chicken and fall veggies! It’s starting to snow here in North Dakota so a new slow cooker would be filled with my favorite wintertime comfort food… a huge pot of Comfort Chili! I would make soup! And BBQ pulled pork! and chicken breasts! I love my slow cooker BUT its dying a slow death…. Oh so cool!! I’m in desperate need of a new one!! I make roasts, stews and soups in my slow cooker. Make them the night before or the morning of and all is ready when I need it to be. A great invention. I would cook pork shoulder, and make pulled pork and potatoes. I would make this plain pot roast http://www.marthastewart.com/313619/slow-cooker-pot-roast but I wouldn’t even turn on the oven! I sent a friend request to The FoodHunter’s Guide on FB – there isn’t a “like” option. I would make my mom’s slow cook lamb stew. The pork chops looks pretty darn good. I sooooo need a slow cooker, I can’t believe I don’t have one as yet. Beef stew is my favorite thing to make but I’m looking to expand into other dishes. I would try so many new things! Been trying to get my boyfriend to buy me one. Maybe pulled pork first! I would love to make butternut squash lasagne in a slow cooker. 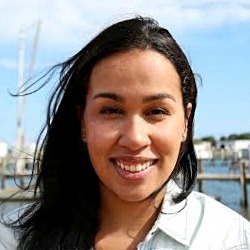 My daughter Stacy Rushton (Dubai) introduced me to your blog. I live in Houston, Texas. I am very excited as I just received my first post from you and my favorite of all foods, PORK CHOPS. In 1972, I enjoyed four marvelous days in Santo Domingo with youngest daughter, returning from two years of life in Caracas, Venezuela. I would make a pot roast with potatoes, carrots and onions! I would cook my mom’s pot roast recipe! I’d make dinner almost every night! We all work full time, so tsh would be a big help! So cliche, but I would totally make these pork chops! I love Sabre salsa, but haven’t tried it in my slow cooker before. This needs to change…immediately. I didn’t know she had one for 2…I have her original “Not your Monther’s…” but living alone it makes just too much. I would love a new slow cooker and her “for 2” cookbook! Hope the Vineyard is lovely and cool! Those pork chops sound good. But the first thing I would cook in the slow cooker would be a beef stew. The weather is getting cooler and this it is classic comfort food for me. Thanks for the opportunity to win. I would use the slow cooker to make a hearty beef stew!